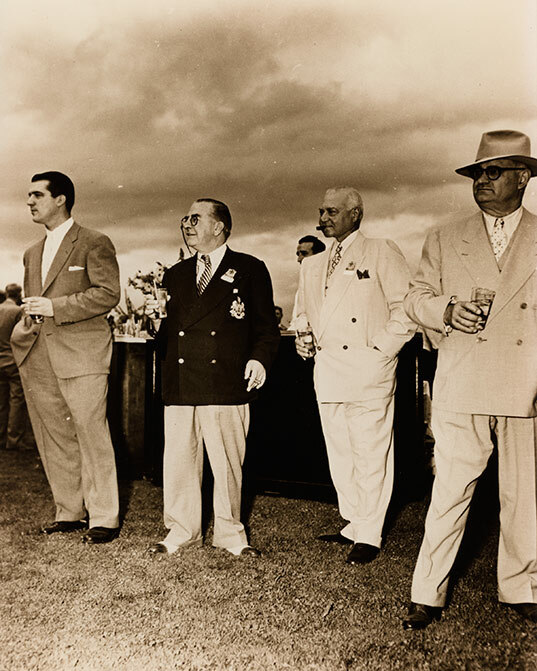 Black and white group photograph of James Franceschini with brother Leonard Franceschini and friends at the Mayors Convention in 1953. The event was held at James' property, Dufferin Haven, at Mount Tremblant, QC on September 23, 1953. The men are all wearing fancy suits. Leonard is shown at the far most right, wearing a light coloured suit with a hat and glasses. He is holding a drink in his right hand. James is standing beside Leonard. He is wearing a white suit, and holding a drink in his right hand while smoking a cigar. Two other unidentified men are standing with the Franceschini brothers. All four men are looking at something happening off camera. There are two other people visible in the far background. It is a heavy overcast day. On June 10, 1940, James was arrested. Shortly after, on June 27, Leonardo was also arrested. Both men were interned at Camp Petawawa as they were considered threats to the Canadian state.